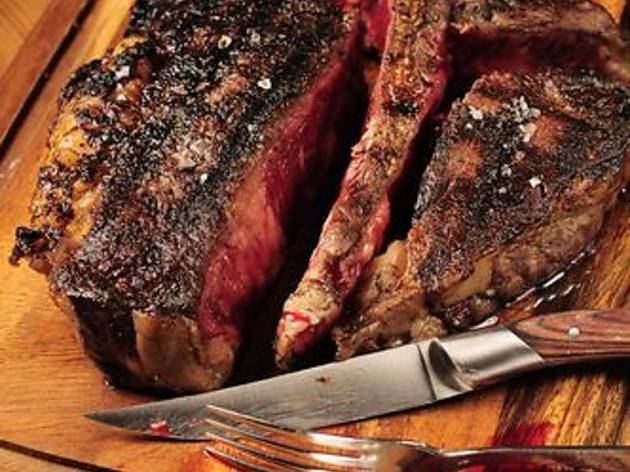 This is no ordinary steak house; it's an 'antique' Italian butcher shop that will grill your meat to your liking. 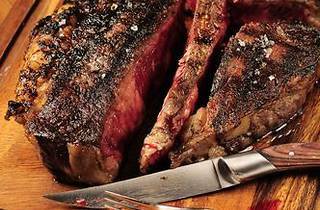 The domenico cut is celebrated here in all its glory, along with steaks from Australia and the US. The owners brought in a famous butcher from Florence to consult on the cuts of beef and you can take the steaks home as well. Review: Vegetarians will doubtless disagree, but sometimes only a steak will do. And for real carnivores with a real hunger, nothing short of a blood-dripping, medium-rare, inch-thick slab of charcoal-grilled aged beef can sate. If that last sentence stirred a primal longing in your gut, save yourself the trouble of reading the rest of this review – Bistecca is the place for you. Taking over the space formerly occupied by Tru, this Florentine-style steakhouse leaves you in no doubt as to what they are all about from the moment you enter. Glance to your left as you head to your table and you’ll see a clutch of glass and metal meat lockers where crimson cuts of beef hang aging. Beside this seductive meat market is the open kitchen, from where bursts of flame and tantalising hints of charcoaled beef regularly emanate. In front of the kitchen sits a glass cabinet stocked with even more alluring cuts of meat while meat hooks hang gleaming overhead. And, just in case you were still in any doubt about the business of the house, rows of meat cleavers of varying sizes cling to magnetic strips along the white tiled wall. Combined with unfussy yet comfortable wooden furniture and gently subdued lighting, the effect is to create an atmosphere that is instantly welcoming, homely and relaxed – unless you happen to be a cow of course. Given such surroundings you may imagine the menu would be wall-to-wall red meat, but this is not the case. Alongside the beef choices (starting at $295 for an 8oz USDA fillet) are a couple apiece of white meat and fish options, six pasta choices, and five salads. Now, we weren’t here for greens, but the good people at Bistecca are determined that you get your daily ration of vegetables to go with all that iron and protein. So much so in fact that they bring you a selection of crunchy veggies – radishes, carrots, celery and the like – to nibble on while you’re choosing the main event. Munching contentedly rabbit-fashion, we ordered up starters of ricotta meatballs in tomato sauce ($98) and grilled mozzarella with marinated tomatoes ($138). Served up with toasted bread on skewers, the mozzarella’s presentation was a little surprising, but we couldn’t fault the creamy, slightly smoky flavour, while the man-sized chunks of tomato were sweet and perfectly fresh. The meatballs were – at the risk of sounding redundant – wonderfully meaty, with little sign of filler, while the sauce was Italian-mama good. The portions of both were generous too, and we started to wonder if we’d bitten off more than we could chew. On arrival of our shared main course, we knew we had. Perhaps it was meat-greed, perhaps it was a miscalculation of stomach capacity, or perhaps it was ounce-to-metric confusion. Whatever the reason, something possessed us to order the Delmonico ($718), a 24oz bone-in rib-eye that apparently serves two. In truth, you could easily split this monster between three or four. The beef is aged wagyu from The Oakleigh Ranch in Eastern Australia, and comes rubbed with kerala peppercorns, sea salt and Tuscan olive oil, then charcoal grilled. We opted to have it Chicago style: charred outside and cooked to order (medium-rare on this occasion) inside. While some places seem to overcook in fear of squeamish customers, these guys know exactly what you mean when you say medium-rare, so there’s no need to err on the extra-rare side if you like a bit of blood. Such simple preparation really lets the quality of the meat shine through, and the taste and texture were spot on. A side of broccoli with anchovy butter provided a good counterpoint to the relentless meat onslaught. Service was efficient and knowledgeable, particularly impressive given we visited in the first two weeks of business, while the wine list offered an understandably red-heavy selection that spanned the spectrum of regions and price points. There’s no shortage of steakhouses in town with loyal followings, but Bistecca will win many converts with its focus on the important elements: quality ingredients, atmosphere, and staff who know their stuff. Judging by the fact the place was virtually full on the rainy Tuesday evening we visited, it seems like the word is out already. 2/F, 15 Lan Kwai Fong, Central, 2525 1308. Daily noon-3pm & 6pm-11pm.